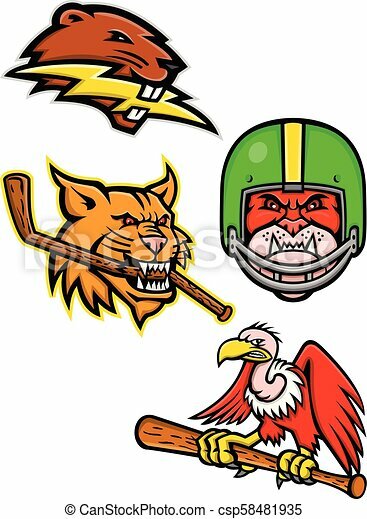 Sports mascot icon illustration set of heads of American wildlife like the North American beaver with lightning bolt, bobcat or lynx cat with ice hockey stick, bulldog wearing gridiron or football helmet and California condor or vulture with baseball bat on isolated background in retro style. wolf and bull. Logo,badge or label design template. Vector illustration. Sport team logo template. Mascot icon illustration set of American football or gridiron and basketball sports mascot like the bulldog, great horned owl clutching ball and razorback or wild boar running with ball on isolated background in retro style. Mascot icon illustration set of African and Australian wildlife animals like the rhino or rhinoceros, kangaroo, common ostrich, Arabian wolf and the Tasmanian devil viewed from side on isolated background in retro style. 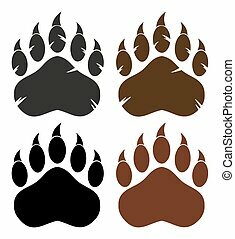 Mascot icon illustration set of heads of American wildlife and folklore heroes like the Artic wolf, jackal, Mohawk warrior, raccoon and Davy Crockett, the frontiersman on isolated background. Mascot icon illustration set of miscellaneous wildlife animals like the great horned owl flying, blue marlin jumping and a mosquito viewed from side on isolated background in retro style. Mascot icon illustration set of ice hockey sports mascots such as Swashbuckler or Pirate, Gray Wolf or coyote, Poseidon or Neptune and a king cobra or hamadryad on isolated background in retro style. Sporting mascot icon illustration set of wildlife as baseball player like the great horned owl, tiger owl or hoot owl, mosquito, king prawn or jumbo shrimp, batting with baseball bat on isolated background in retro style. Mascot icon illustration set of table tennis or ping-pong player striking, smashing, blocking a ping pong ball with paddle or racket on isolated background in retro style. Mascot icon illustration set of ferocious and fearsome fishes like the barracuda, moray eel, northern pike or muskellunge fish, the piranha, pirana or caribe viewed from side on isolated background in retro style. Mascot icon illustration set of ice hockey sporting mascots like the saber toothed tiger or sabre-toothed cat, musketeer or cavalier, musk ox or muskox holding an ice hockey stick on isolated background in retro style. Mascot icon illustration set of fruits playing as baseball player batting with bat like the apple, red chili pepper or chilli and the acorn or oak nut viewed from side on isolated background in retro style. Mascot icon illustration set of heads of Amazon wildlife like the vampire bat, emperor tamarin monkey, harpy eagle, sloth and alpaca or llama viewed from on isolated background in retro style. Mascot icon illustration set of heads of American presidents, patriot, heroes and statesman like Abraham Lincoln, Benjamin Franklin,Theodore Roosevelt, Thomas Jefferson and George Washington, viewed from on isolated background in retro style. Mascot icon illustration set of lacrosse and baseball sporting sports team mascots like a stag deer, armadillo and bighorn ram, mountain goat lacrosse players and a largemouth bass baseball player on isolated background in retro style. Mascot icon illustration set of lacrosse and ice hockey sporting sports team mascots like an bull terrier and American bully dog ice hockey player, lynx or bobcat and mongoose lacrosse isolated background in retro style. Mascot icon illustration set of heads of American Generals and Statesman like General Robert E Lee, General Stonewall Jackson, General Ulysses Simpson Grant, Theodore Roosevelt of the Rough Riders, an American revolution commander and Uncle Sam on isolated background in retro style.